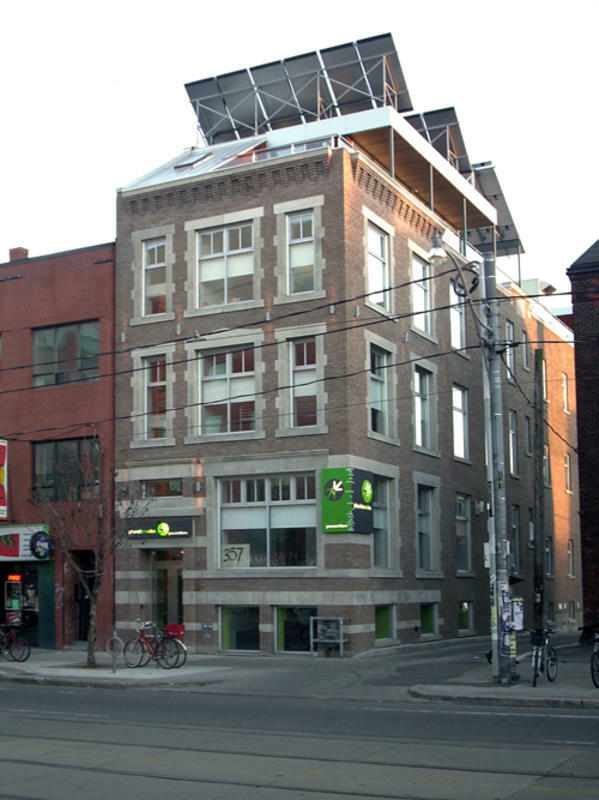 Welcome to the newest, greenest and most innovative hostel Toronto has to offer. We have put a great deal of thought into providing the most enjoyable hostel experience possible. It's guests that make a hostel fun, and our staff and facility are here to help you make the most of your time in Toronto. Secure dorms have custom-designed hotel style ensuite bathrooms, private locker areas and extra comfy memory foam mattresses to ensure the best night's sleep you'll ever have away from home. Cook up a feast in our fully-appointed kitchen or relax and meet other travelers in our beautifully designed common area, which features a fireplace, phone booths, a dining hall and an awesome couch where you can watch TV and movies on our flatscreen television. Free breakfast is served daily in our rooftop lounge, where you can also enjoy panoramic views of the Toronto skyline and play X-Box Kinect with new friends. Our location in the heart of downtown Toronto is minutes away from the best the city has to offer. Kensington Market, Little Italy, the Annex and Chinatown are literally at our doorstep. These neighbourhoods are famous for their diverse mix of bars, restaurants, cafes and great shopping opportunities. We're also very close to the Royal Ontario Museum, the Art Gallery of Ontario, the University of Toronto and the Bay Street Bus Terminal. Free personal lockers with integrated powerpoints for charging laptops, phones, cameras etc. Take the 192 Airport Rocket bus to Kipling subway station. Travel east on the subway to Spadina station. Transfer to the 510 Spadina streetcar and take it southbound to College Street. The hostel is a short walk west on College Street, just past Augusta Avenue. Take the 510 Spadina streetcar northbound to College Street from Union Station. The hostel is a short walk west on College Street, just past Augusta Avenue. The hostel is a 20 minute walk from the bus terminal. Travel north on Bay Street to College Street. Turn left and walk west on College Street. The building is just past Augusta Avenue. Take the Spadina Avenue exit and drive north to College Street. Turn left on College Street. The hostel is on the south side of the street just past Augusta Avenue. Parking is available in the lane next to the building.